Realm of Chaos | Azazel's Bitz Box. As I was going through and continuing to repair the damage wrought onto my blog by Photobucket (yep, I’m still plenty bitter!) I found this post – one of my earliest. My seventh, in fact. The models here have by now all been shown again in some form or another – the Iron Warriors especially having been one of the armies I’ve refocused on for 8th edition – finally completing these models and more. This post being more than seven years old shows how long a road its been to get them up and running on the table and they’ve now had a couple of games as I relearn 40k. The Nurgle guys were promoted into the “leadership team” for my Nurgle Lost and the Damned Cult back in 2015 – and now I need to go fix up that series of posts very soon. 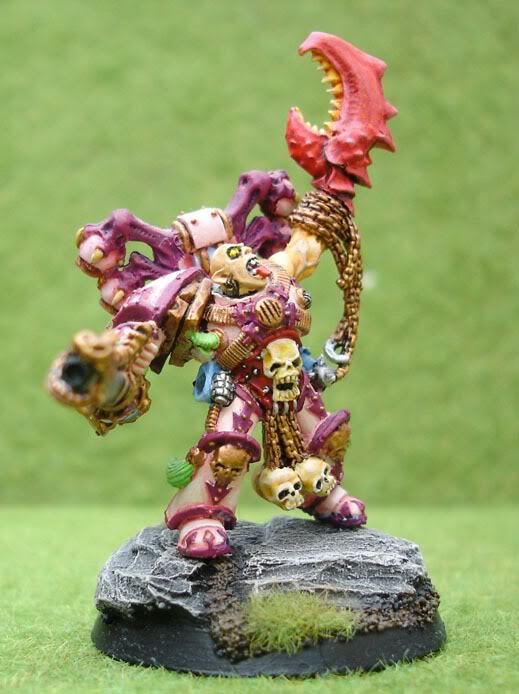 The Slaaneshi model is probably the most tragic of the lot here – he’s never seen the table despite being converted around 2nd-3rd edition and painted sometime before I posted the original here – around 2009. 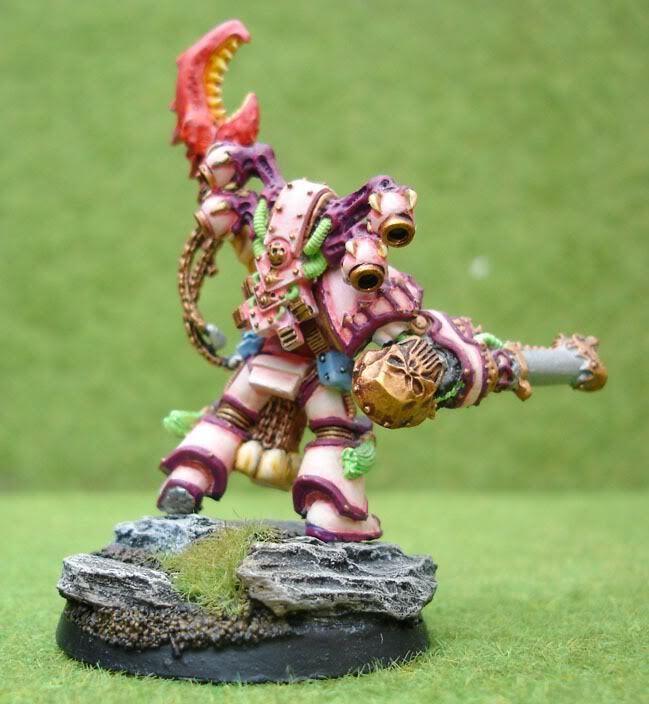 I do plan to build at least a small Emperor’s Children force in the near-mid term, so it’s in the cards for him at least. Since the majority of my recent posts have featured Lord of the Rings figures, I thought a bit of variation was in order. These figures are various Warhammer 40k Chaos types, to be used as various champions in 40k, if I ever get around to playing it again. 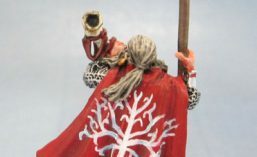 All are conversions, and mounted on the same range of scenic resin bases from Back to Base-ix that the Orc in the first post is on. These figures were mostly finished during my previous foray back into painting miniatures, around the middle of last year. They were started.. a long time ago. This entry was posted in 40k, Iron Warriors, Nurgle's Legions, Realm of Chaos, Work in Progress. Bookmark the permalink. Thank you Luke – click the link above to the original post for a few other models as well! Very nice, particularly the Iron Warriors. 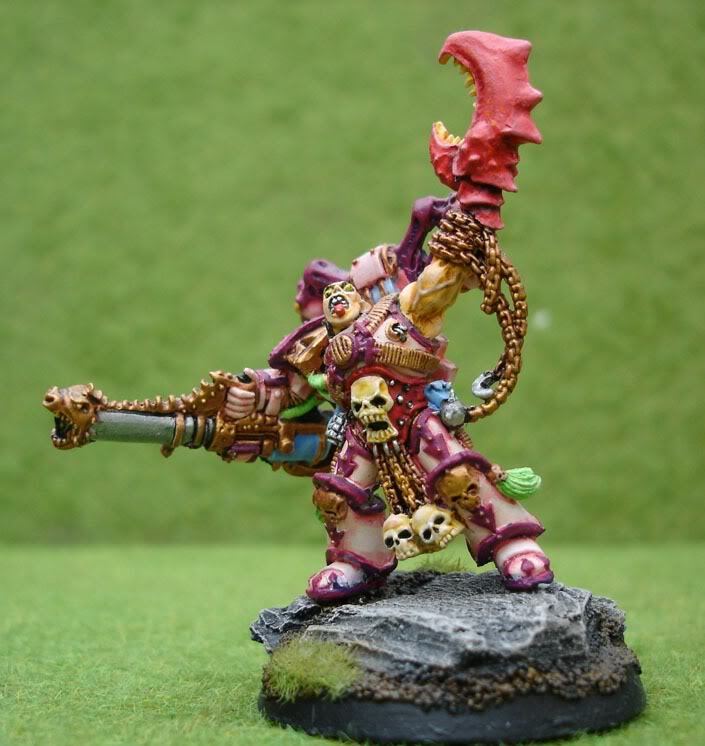 I am a bit shocked though to see the mighty Kharn being used as the basis for a weak foppish Slaanesh worshipping swine! Haha ditto on what Warbs said above but it does look cool. That’s what too much Dubstep would do to you! Haha! Yeah, I reckon you’re right!